Honey extractors are rugged and simple mechanical devices used for extracting honey from honeycombs. They utilize centrifugal force within a drum or a container that has frame baskets. This is where the combs are spun and the honey flung out. Extracting is one of the final steps in the beekeeping process, and it’s where you reap your rewards for all you’ve sowed. There are great benefits associated with honey extractors and these cannot be ignored. Its primary benefit is that it ensures the combs remain intact and can be reused by the bees to make more honey. There are two types of extractors to choose from: radial or tangential. The main difference between them lies in the manner in which the frames are held within the basket. Either of these types can either be manually or electrically powered. With the various honey extractor brands available in the market, you can never run short of choices if you’re considering to get one. So, let’s help you make that decision with our hand picked list of the best honey extractors available on the market today. Let’s check them out. The XtremepowerUS 2 Frame Stainless Steel Honey Extractor has three adjustable legs that allows you to work with it at a height that is convenient. The stainless material makes it durable and insulated from rust. It’s easy to clean too since the components come apart very easily. Though, the manufacturers have to work on the legs because it does wobble when it is in operation if it is not fixed to the ground. Also, the packaging should be improved upon because there have been instances some of the parts do not get to the customer in one whole piece. The handle is also another area that the customers complain about as it breaks easily. To get the best out of this extractor, a redesign of the handle is inevitable. But despite all this, it is a good extractor and quite affordable at that. Click here to read our full review of the XtremepowerUS 2 Frame Stainless Steel Honey Extractor. This extractor also comes with an electric uncapping knife which heats up speedily enabling it to easily cut wax through wax. 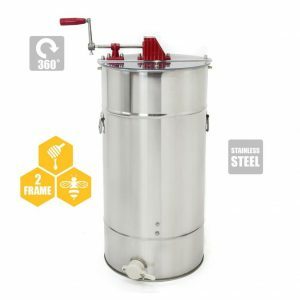 The Best Choice Products 2 Frame Stainless Steel Honey Extractor comes at an affordable price and does not disappoint when it comes to performance. One of its key pros is the fact that it comes with clear and easy-to-understand instructions. It is also easy to use and has a well functioning honey gate. It is a good fit for the beginner or casual beekeeper. 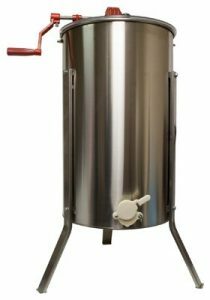 Click here to read our full review of the Best Choice Products 2 Frame Stainless Steel Honey Extractor. Some of the other striking features of this product include a clear and double-sided lid. This allows for easy viewing of the drum and a solid metal crank that is reliable when it comes to spinning the drum baskets. One of the major setbacks associated with this extractor is the fact that it has sharp edges on its legs. If you are not careful you may end up getting injured. Overall, it is a good unit and I would recommend it to anyone especially if you just started you beekeeping business. It is a good performer and definitely good value for money. 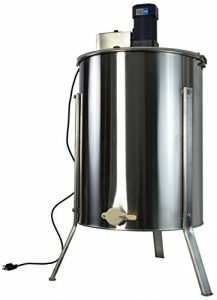 If you are a more experienced beekeeper then you can never go wrong with the Little Giant Farm & Ag Stainless Steel Honey Extractor. It is a tangential extractor that is well pleasing thanks to its amazing inner and exterior features. It has a clear plexiglass lid so you can monitor progress, and its overall build is sturdy and durable. What particularly intrigues me about this stainless steel extractor is the fact that it is a capable performer that is highly efficient. 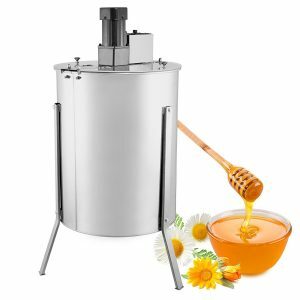 Click here to read our full review of the Little Giant Farm & Ag EXT2SS Stainless Steel Honey Extractor. Some beginners might find it frustrating to use this honey extractor but overtime, with practice it should become easier to use. This is due to the fact that it does come not come with any instructions. There is also some slight paint chipping on the extractor so I’d advise to inspect carefully before use. The Goplus 2 Frame Stainless Steel Honey Extractor is also a top notch honey extractor. It is particularly built for those on a low budget, especially the hobbyists who simply want to get a basic extractor for less demanding honey extraction. I like the Goplus 2 Frame Stainless Steel Honey Extractor because of the great quality it provides. However it also has its shortcomings. Some of its key features include the clear lids that allow the user to view the drum and monitor progress. It is also of a decent size and not bulky. You will therefore find it easy to carry it around your beekeeping enterprise. Professional beekeepers may find this extractor to be a bit limiting. Click here to read our full review of the Goplus 2 Frame Stainless Steel Honey Extractor. This honey extractor from Goplus is built to last and is also easy to use. If you are just starting out as a beekeeper, it will suit you well. It is one of those units that will grow with your business. The unit does not come with instructions for assembly or product maintenance and thus you have to go an extra mile in learning about them. However, this unit still remains a favorite for many beekeepers. VIVO is one of the top global brands known for its excellent quality beekeeping products. 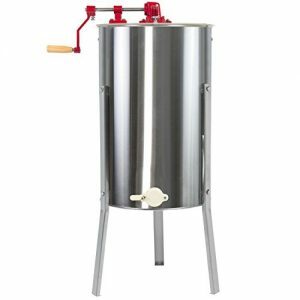 The VIVO 2 Frame Stainless Steel Honey Extractor is a solidly built unit that is designed for the casual beekeeper. It comes with a stainless steel finish and has two carrying handles for easy handling. It also has a well functioning stopper or honey gate. Its drum of 29 inches is sufficient in accommodating a reasonable number of frames. Click here to read our full review of the VIVO BEE-V002 honey extractor. Some of the main pros of this unit include: value for money, durability, and how easy it is carry. On the flipside it has some design issues and the sharp edges pose a risk of injuring the user. Overall, this unit is an good performer. The price is reasonable and it has all you need as a casual or amateur beekeeper. The business of honey extraction is not easy. You have to harvest at a particular time to get the best results. However, if you want the best results either with a small or large frame, then this implement will give you expected results. There is a hand crankshaft which the processor uses to spin frames inside the housing of the extractor at a very high speed which forces the centrifugal power to push the honey from the frame. Click here to read our full review of the Harvest Lane Honey 2 Frame Metal Extractor. The Harvest Lane Honey 2 Frame Metal Extractor can be used to simplify the process of honey extraction. The material is made from food grade stainless steel which is easy to clean after every use. This extractor has the capacity to hold up to two frames and its three legs make setting it up anywhere a possibility. It is ideal for deep, medium and shallow frames. It is durable and the extraction method is fast and clean. The hand crank is fast in spinning the frames and the enclosed gears cannot contaminate your honey. This extractor is a great buy at its price which is pocket-friendly. Every beekeeper understands that there can never be a substitute for an excellent quality honey extractor. 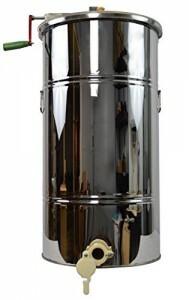 The Mann Lake HH160 Stainless Steel honey extractor comes with a plethora of amazing features. 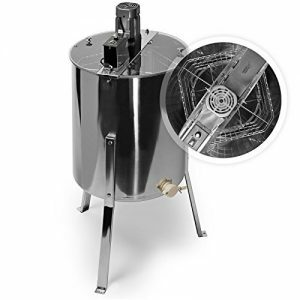 It is a 26 gauge stainless steel unit specifically built for the savvy beekeeper. One thing that’s special about this unit is that you can buy and forget about buying any other for years. It is a tangential extractor with the capability of holding up to six shallow and three medium or deep frames. 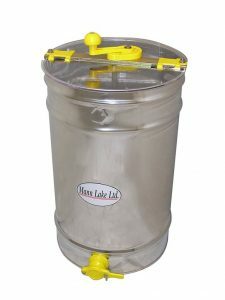 The Mann Lake HH160 extractor has a dimension of 18 inches width and a height of 26 inches. Since it is tangential in nature, that means you have to remove the frames and flip them so as to extract on both of the sides. The extractor comes with a 1-1/2 inch honey gate, weighs approximately 26.1 pounds and it does not have legs. The unit is a no-brainer to use and it is quite easy to clean as well. You will also like the fact that it is made of stainless steel. This means it is resistant to rusting and abrasion. I must say that I was impressed with its performance. It was fast in extracting the honey and was easy to clean. On the downside I would be happier if it had legs. TheRidgeyard Pro 3 Frame Manual Stainless Steel Honey Extractor is a durable, top class product that’s built to last. It is very easy to observe during operation and there is no way debris can come inside, this ensures that you get honey in its purest form. If you want to take up beekeeping as a hobby, then this is an ideal tool for you, the apiarist and those using it for home based business will find it suitable for their needs. It is easy to operate and assemble, and that is the reason why it is ideal for beginners. Click here to read our full review of the Ridgeyard Pro 3 Frame Manual Stainless Steel Honey Extractor. It has two handles for easy carrying. The cleanup is easy with warm water and soap. It has an enclosed metal gear which keeps it clean and free from honey. The extracted honey can easily come out because of the conical shape of the bottom gear. If you want to have the best extract from this implement, then use it at a low to minimum speed when extracting honey. This extractor is well worth the price tag; it provides great value for the money. This is an excellent honey extractor for the money. 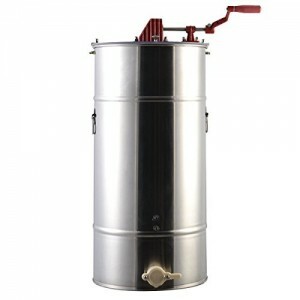 It is a manual extractor with a 16 gauge stainless steel tank. It also has a clear plexiglasss top that allows you to monitor the honey extraction process. Other great features of this extractor include: an optional stand or leg and a steel gear construction that has sealed bearings. Click here to read our full review of the Hardin Professional 3 Frame Manual Honey Extractor. You will never be disappointed by this top notch honey extractor. In case you are not satisfied with it you can return it since it is covered by a lifetime warranty. This extractor is definitely worth every penny. Different buyers have their own unique preferences when it comes to honey extraction equipment. However, no one is ever willing to try out a brand that has a bad reputation. Goodland Bee Supply is one of those brands popularly known by most beekeepers. Its beekeeping equipment is synonymous with good quality and the 2 frame honey extractor is no exception. The sturdy extractor has been built with some features that not only guarantee efficiency but also provide convenience of use. 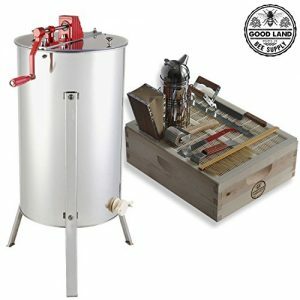 Some of the notable features of the Goodland Bee Supply 2 Frame Honey extractor include: 16-gauge stainless steel construction, three piece legs for maximum stability, additional beekeeping accessories (bee smoker, uncapping roller, frame spacer, and frame grip), manually operated tangential honey extractor, and a double sieve design. The unit will fit nicely into a 5 gallon bucket and since it is made of steel that means it is easy to clean, can resist rust and other elements and will last for a good while. This unit is ideal for the beekeeper who owns between 1 to 10 hives. It can accommodate 2 deep, medium, and shallow frames at a go and that means you will accomplish you task within a short time. The unit’s uncapping roller comes in handy whenever the hot knife has missed some places in the honey combs. Other notable features of the extractor include: a comfortable wooden handle, long extractor needles for maximum extraction, spacious unit, and optional cheesecloth. Some of the features that I particularly liked include: the legs, its sturdy built, spacious frame basket, additional accessories, cleans up easily, ability to spin fast, and the affordable price. However, it would have been better if it had a gear for slowing it down when you want to stop it. A clear Plexiglas lid that enables easy viewing while the extraction process is going on. The royal leg stand that makes offloading of the honey a hassle-free process. The rave combinations of the above features make this extractor a model when it comes to the issue of its performance index. It has a 110v variable speed that ensures a fast and clean extract of the honey from the honeycomb. It can achieve the extraction of two deep, medium or shallow frames. Another beautiful thing going on well with this model is the availability of its parts in the event that you need a replacement. On the downside however, there is need to improve on the design of the drum which accommodates the frame. It has crossbars pressing into the comb thereby blocking some of the honey from coming out. This issue should be looked into and a good adjustment should be made that will stop this loss of extracted honey. Overall, the Hardin Royal 2 Electric Two Frame Stainless Steel Honey Extractor us no doubt an excellent buy. It will give you great value for your money. The OrangeA 4 Frame Electric Honey Extractor from is designed with the end user in mind. All its features have been tailored to ensure maximum efficiency, versatility, and convenience. The spacious 4 Frame unit measures 50 cm wide and 85 cm high. It is very powerful, delivering up to of 1300 revolutions per minute (rpm) thanks to its 1.1A, 120W motor power. 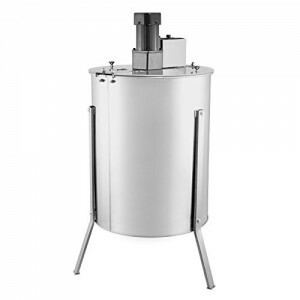 The unit has 3 stainless steel legs that provide some convenience when extracting the honey. You also get a plastic honey gate, 2 clear Perspex lids for monitoring progress, and a conical drum. It is a tangential extractor that meets the needs of the hobbyist or beginning beekeeper. 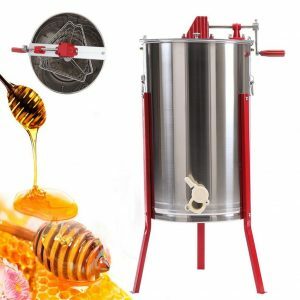 Other notable features of this electric honey extractor include: a slightly rounded inner honeycomb mesh that ensures the honey combs do not break. The unit can spin 4 frames at once and that means you can complete your honey extraction within a short time. It is also relatively lightweight, barely 37.5 pounds. I found that the OrangeA 4 Frame Electric Honey Extractor extracts the honey quickly. The motor is not loud when in operation and the unit worked smoothly. On the downside, I was forced to raise the unit with bricks so that it fits a honey bucket. But overall, this unit delivers as expected. The FoodKing 4 Frame Electric Honey Extractor is custom made from 304 stainless steel material; this makes it ideal for all manners of beekeeping and adds to its durability. You deserve a view of the actual extraction while it’s going on, and this is made possible due to the clear Perspex material that the double-sided top lid. It can hold up to 4 frames and it works via an electric motor whose operations are environmentally friendly because the noise produced during operation is very quiet. This design is catered towards experts on one hand, and for newcomers on the other. It fits shallow, medium and deep frames. The design of the bottom inside ensures that every drop of honey comes out, and it is a great advantage during cleaning as there is less work to be done. Different honey extractors are not created equal. Each unit has its pros and cons and they have been designed to suit the varying needs of the buyers. if you have many bee hives then that means you have to get an extractor that can handle that number. The same applies to those with few hives. You should also consider your budget since different units have their own unique prices. The Honey Keeper Pro 4 Frame Electric extractor happens to be one of those units that compete well with similar high-end extractors in the market. It is a stainless steel unit that comes with a clear plastic lid for monitoring the extraction process. It is designed to fit 4 deep, 8 medium, or 8 shallow frames and has a well-positioned honey gate. The unit is also easy to assemble and use. The Honey Keeper Pro 4 Frame Electric honey extractor features a variable speed motor that allows you to control how fast the extractor is spinning. The motor has an on/off switch and a 120 volt grounded power cord. The legs of this extractor are made of stainless steel can be attached to the floor or removed whenever necessary and based on user comfort. The legs actually raise the extractor 12 inches off the ground such that a 5 gallon bucket can perfectly fit underneath the extractor. It is also easy to spin thanks to its steel gears and sealed bearings. Furthermore, the unit can easily be cleaned using warm soapy water. The Honey Keeper Pro 4 Frame Electric honey extractor is quite efficient and provides great quality. This sturdy and heavy-made extractor is well worth its price. On the downside, I found that sometimes the handle still turns after you stop spinning. But overall, this is a definite quality for the money. VIVO as a brand has become a household name. It is known for top performing products and this includes beekeeping equipment. Its BEE-V004E 4 Frame Electric honey extractor has taken the market by storm. It comes fully-packed with amazing features and is ready for use. The sturdy unit is built from 304 stainless steel material and that means it can easily be cleaned and can resist rust and abrasion. Its 18.5 inch diameter drum is capable of holding 8 shallow, 8 medium, or 4 deep frames at once. The unit also has good clearance for placement of the honey bucket. It allows a distance of 15.75-inches between the honey gate and the floor. You can easily monitor the progress with your honey extraction process when you use this unit. Its clear Plexiglass lid is well-positioned within the extractor for easy viewing. It also keeps off dust and other particles during extraction. The unit has been built for all skill levels and therefore a beginner will use it for many years. Other important features include a 120V AC motor that comes with a built in fan to prevent it from running too hot. It also has a built in safety feature which causes the motor to automatically power off whenever the lid is opened, and automatically resumed whenever its closed again. Click here to read our full review of the VIVO BEE-V004E honey extractor. 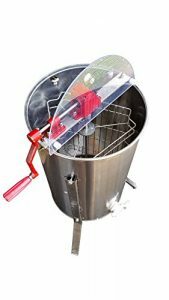 The extractor spins smoothly, is easy to assemble and disassemble, comes with a conical shaped bottom and weighs 45 pounds. The VIVO BEE-V004E is a quality extractor and I am more than happy with the unit. It’s easily assembled and it is sturdy and well built. Overall, this unit performs beyond expectation. The honey extractor’s mode of operation can either be radial or tangential. This refers to the manner in which the honey frames are arranged in the drum and span in order to remove the honey from the frames. 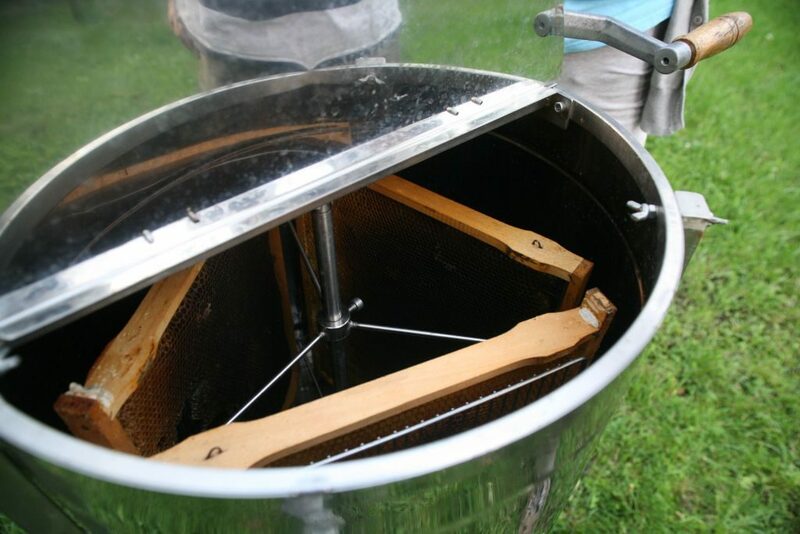 Within the honey extractor is a drum where the frames are placed and then the spinning begins. The frames that have been uncapped are placed on the drum for the honey to flow out from the wax cells. Uncapping is usually done using a hot knife or a hot air gun. Once uncapped, it becomes easy to remove the honey from the frames. The honey hits the walls of the drum and is then directed to the bottom of the drum where it flows through the valve located on the edge of the honey extractor. Any honey that has been extracted from the frames should be collected immediately. Otherwise when it stays for too long it affects the spinning process. A tangential honey extractor refers to the extractor where the every frame is removed then flipped for a second round of spinning. Each side of the frame has to be span once so as to remove the honey from both of the frame sides. This is means it takes plenty of effort to spin a bigger number of honey frames. It is cheaper than the radial extractor. Since you spin every side individually, chances are high that nothing remains in the frames. Ideal for a small enterprise since it is cheaper. This is taxing since the frames have to be removed and flipped every time. It may not suit a beekeeper with many frames to extract. Not the best for the commercial beekeeper. 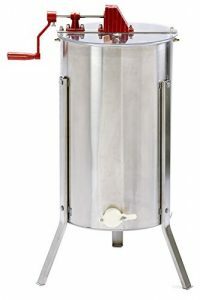 The radial honey extractor is the most popular among beekeepers. In this extractor, the honey frames are usually loaded once then both sides of the frames are span at once. This is highly efficient when compared to the tangential since you do not have to keep removing and flipping honey frames. It will therefore be a great choice for commercial beekeepers since they have to spin plenty of honey frames. Spins more frames within a short time. Well suited for commercial beekeepers or those who have many beehives. No double work when extracting honey from frames. It is more expensive when compared to tangential honey extractors. The tangential and radial honey extractors may also be further categorized as either manual or electric powered. You therefore have to consider this. If you cannot handle hand cranking then it makes perfect sense to get an electric powered unit. A combination of radial and electric powered features makes the best choice for those with huge beekeeping operations. You can also buy such a combination if you started small and have plans of scaling up with time. 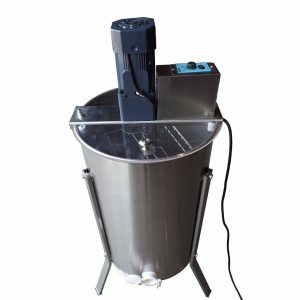 The honey extractor can either be manually operated or electrically powered. As the name suggests, each of them works based on the kind of power or effort involved in the operation. Whether manually or electrically operated, honey extractors all work in the same manner – they utilize centrifugal force. Within the interior of the extractor is a cylindrical drum that holds the frame basket. This drum is spun either by manual force or electric power and it removes the liquid honey from the combs. As the name implies, this type of honey extractor is powered by electricity when spinning the bee frames placed at the central shaft of the extractor’s drum. This unit uses an electric motor that is linked to an electric current supply which generates the power required for spinning the frames within set speed. The speed at which the frames are spun must be regulated. Too high speed can damage the frames and render them useless. Spinning speed that is too low on the other hand may not remove any honey from the frames. Electric honey extractors are used in large scale commercial operations, but they can also be used by smaller beekeepers too. The electric honey extractor removes large amounts of honey within a shorter time. They are the easiest to operate. All you have to do is turn on the electric motor and the spinning begins automatically. In terms of speed, the electric unit is faster than a manually operated extractor. It is best suited for large scale bee farms. Quite expensive when compared to manual extractors. The manual honey extractor is operated using your hands or through use of physical effort. It does not require electricity to operate. Manual extractors generally have the same internal components as its electric counterparts except the electric motor. It can hold 2 to 4 frames. It does a good job even in areas without electricity. It does not damage honey combs since speed is controlled by hand. Energy conscious, no electricity bills to be paid. It is cheaper than electric extractors. Less efficient when compared to electric extractors. Does not suit commercial beekeepers. Both the electric and manual honey extractor does an excellent job when it comes to extracting honey. You need to evaluate your needs before deciding on which one to buy. Before you buy your honey extractor, ensure you evaluate its features and compare various brands before you settle on one. You can’t go wrong with any of the best honey extractors discussed above. Each of these units are built to last and can perform efficiently well. Choose the one that is within your budget and best meets your needs – whether tangential or radial, and whether manual or electrically powered. Do you own any of the honey extractors on this list? Which extractor(s) do you think should be added to this list? Leave a comment below and let us know.